Last year after I finished my first sweater, I decided to start a second one. And it took a whole year to finish. Well not really, I started on the sleeves and knit them both at the same time, then the back and the front was started and not finished. It was left on the needle for more than 8 months until I got it back out to finish it. Then I cast it off and it stayed in four pieces for about a month until my mom seamed up the sides for me. We also did the collar after it was seamed together and then the last thing added were the sleeves. I don’t seam things up myself, my mom always does it for me and I’m grateful because she does an amazing job. If you remember my first sweater it ended up being way to big and bulky and it was short and boxy on me. What I did to make this sweater better fit was to modify the first pattern I used to make this one. I put my first one on and pulled the sleeves and body to me and marked it and then subtracted the number of stitches and that worked. I used the same yarn as the first one, Lion Brand’s Heartland in Olympic. 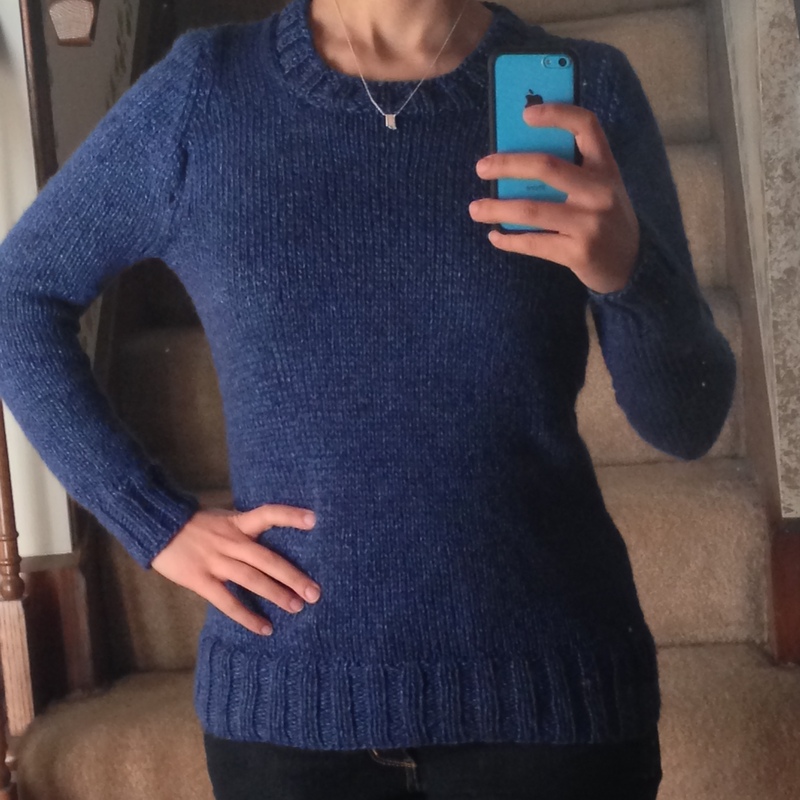 I love this shade of blue and this sweater looks much better than the first. It may have taken a long while to finish but I’m grateful its done. I love it so much that I’ve worn it two days in a row. Also I’ve listed new items in my Etsy shop. A baby blanket and a lap blanket. Has it taken you over a year to finish a project? Let me know in the comments. Such a beautiful photo! I’m hoping to start my first sweater this year, so love reading about other people’s sweater adventures! Awesome! This is impressive. I wonder if I would have the patience to knit one. I am such a slow knitter.